Once again, journalistic ethics is in the news. This week’s crime is a Newsweek cover story by British historian Niall Ferguson–a 3,300-plus-word screed against President Obama marred by frequent inaccuracies and lapses of logic. This discussion has led to a round of reminiscing about the vanishing role of the fact-checker–see, for instance, Ta-Nehisi Coates’ Atlantic post. If only Newsweek hadn’t sacked its fact-checkers in 1996, this argument suggests, the magazine would not have shredded its credibility by publishing such an embarrassing article. I know a little about fact-checking: My first two jobs in journalism were internships that centered around fact-checking lengthy “think pieces” for Foreign Policy magazine (then owned by the Carnegie Endowment for International Peace, now a Washington Post Co. property). It was tedious work: You’d print out a draft of a story, take out a red pen or pencil (memory fails me there) and underline and sequentially number every objectively verifiable detail. On a separate sheet, you’d cite your source for each item. 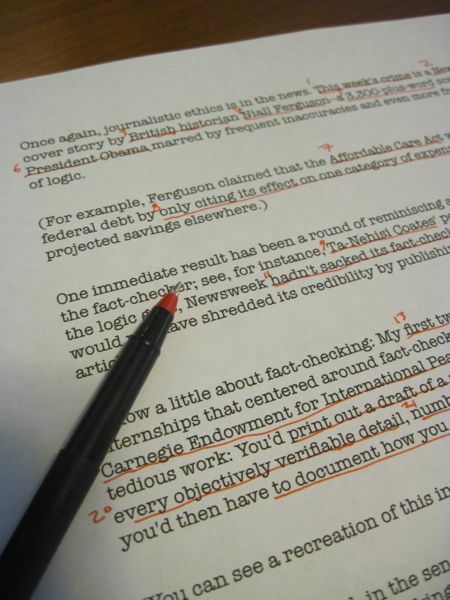 The process generally worked, allowing writers to advance different interpretations of the same verified set of facts. The work also taught me about properly documenting my own research, something I hope is obvious in my compulsive linking–not that it’s stopped me from making the occasional stupid error. But it shouldn’t take a dedicated fact-checker to keep a laughably off-base piece from getting published. All you need is a decent editor. Editors should be reasonably well-grounded in the field a reporter covers to tell a writer to find a better source, address an unanswered question or mention a relevant historical factor. But even somebody parachuting onto a desk should still possess a BS detector sufficient to flag when a story’s logic gets nowhere near proving its thesis. If you can’t or won’t apply those entry-level skills–no, having a name-brand contributor or calling the piece “opinion” doesn’t excuse you–then what are you doing in front of the keyboard? This entry was posted in Journalism and tagged accuracy, editor, fact-checker, Foreign Policy, journalistic ethics, Newsweek, Niall Ferguson by robpegoraro. Bookmark the permalink. Nope, I pretty much need a spell checker, grammar checker, copy editor, political correctness checker along with my fact checker. Spot on Rob. I did not find Ferguson’s whiny rebuttal–in which he attempts to defend his errors by throwing out tidbits he didn’t see fit to include in the original story–persuasive. What can readers expect from a print magazine that can’t make enough money to support itself? The entire company / brand was sold within the last year or two for $1 plus assumption of it’s massive liabilities. That doesn’t sound like an organization that can afford to put out a thoroughly researched and fact-checked news product. And this may be judging a book by its cover, but when they agree to a takeover by the “Daily Beast,” it doesn’t sound like they’re still trying to be a serious fact-based-news organization either. It sounds like they’re trying to print material that will generate buzz, and hopefully sell to a lower-brow clientele, rather than to those who just want the facts, accurately presented. Not sure about the lower-brow clientele thing, but I can’t argue with Newsweek’s editors wanting to “generate buzz.” I felt guilty about linking to Ferguson’s rant in the first place–as if I were rewarding them.